Climate Common Sense: They never give up! As the world cools the Ministry of Climate Truth is working overtime using Orwellian principles to brainwash the public. In Orwell's 1984 brainwashing was used to convince the populace that conflicting statements were true. Any rational person would think that the type of propaganda depicted in 1984 would never work with an modern intelligent society but the warmists have achieved much by cloaking their nonsense in scientific mumbo- jumbo and asking the public to believe it as it is "science". Trying to rationalise that increasing snow is being caused by global warming is the last gasp of the AGW scammers as the recent planet warming cycle disappears before their eyes. Of course this research paper liberally uses those magic climatologist weasel words "could , may and might" and the confirmation bias is obvious but we have come to expect no more from "climate scientists". It seems counterintuitive, even ironic, that global warming could cause some regions to experience colder conditions. But a new study explains the Rube Goldberg-machine of climatic processes that can link warmer-than-average summers to harsh winter weather in some parts of the Northern Hemisphere. In general, global average temperatures have been rising since the late 1800s, but the most rapid warming has occurred in the past 40 years. And average temperatures in the Arctic have been rising at nearly twice the global rate, says Judah Cohen, a climate modeler at the consulting firm Atmospheric and Environmental Research in Lexington, Massachusetts. Despite that trend, winters in the Northern Hemisphere have grown colder and more extreme in southern Canada, the eastern United States, and much of northern Eurasia, with England's record-setting cold spell in December 2010 as a case in point. First, the strong warming in the Arctic in recent decades, among other factors, has triggered widespread melting of sea ice. More open water in the Arctic Ocean has led to more evaporation, which moisturizes the overlying atmosphere, the researchers say. Previous studies have linked warmer-than-average summer months to increased cloudiness over the ocean during the following autumn. That, in turn, triggers increased snow coverage in Siberia as winter approaches. As it turns out, the researchers found, snow cover in October has the largest effect on climate in subsequent months. That's because widespread autumn snow cover in Siberia strengthens a semipermanent high-pressure system called, appropriately enough, the Siberian high, which reinforces a climate phenomenon called the Arctic Oscillation and steers frigid air southward to midlatitude regions throughout the winter. "This is completely plausible," says Anne Nolin, a climate scientist at Oregon State University in Corvallis. The correlations between warm summers and cold winters that originally led the researchers to develop their idea don't prove cause and effect, but analyzing these trends with climate models in future studies could help researchers bolster what Nolin calls "an interesting set of connections." "Northern Eurasia is the largest snow-covered landmass in the world each winter," she notes. It only makes sense, she argues, that it would have a big influence on the Northern Hemisphere's climate. Indeed, she adds, previous studies have noted the link between Siberian snow cover and climate in the northern Pacific. 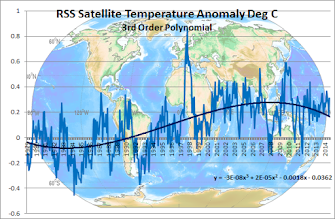 The team's analyses suggest that climate cycles such as the El Niño-Southern Oscillation, the Pacific Decadal Oscillation, and the Atlantic multidecadal oscillation can't explain the regional cooling trends seen in the Northern Hemisphere during the past couple of decades as well as trends in Siberian snow cover do. If better accounts of autumn snow-cover variability are incorporated into climate models, scientists could provide more accurate winter-weather forecasts, the researchers contend. Why is it that extremely qualified climate scientists who are highly-regarded leaders in their field like Pat Michaels, John Christy and Richard Lindzen are routinely dismissed as "Mere deniers who are being paid off by Big Oil".... and the journos and the public believe it? I don't normally consider conspiracy theories, but this blatant public brainwashing and denigration of *real* scientists makes me wonder just what is really going on? "In general, global average temperatures have been rising since the late 1800s, but the most rapid warming has occurred in the past 40 years." This is clearly untrue. 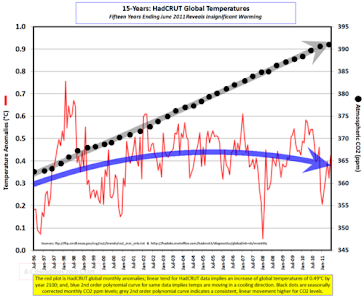 Perhaps the author meant "the most rapid warming over a 40 year period since 1860 when reliable thermometers became widespread.". This itself is a very weak claim; it refers to a 40 year period selected out of 150 years, which isn't exactly a one in a million chance. But unfortunately, even this weak claim is untrue. The 40 years 1958 - 1998 warmed more than the 40 years 1970 to 2010. As have several others. Perhaps the claim should be "the last 40 years have seen a more rapid increase in global temperature than most 40 year periods since 1850." That would seem to be correct, but doesn't exactly indicate the sky is falling in, which I assume is what the author was trying to do.